Right now you can get this Melissa and Doug Bread and Butter Toaster Set (9 pcs) for ONLY $8.48 (Retail $14.99)! It's time for toast! 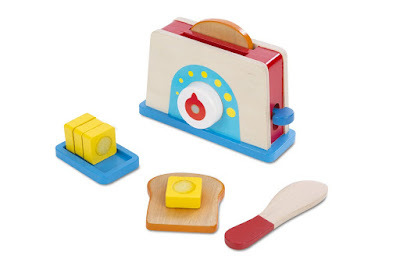 Lightly toasted or well done, one pat of butter or two--young chefs in training can prepare one or two pieces of playtime toast to order with this wooden Bread &amp; Butter Toaster Set. Place the wooden slices of bread in the slotted toaster, turn the dial to set the darkness level, and push the down the handle to toast! A wooden dish holds four pats of butter held together with self-stick tabs; cut them apart with the child-friendly knife and add a little or a lot of butter to the pieces of toast. A reusable activity card makes it easy to place and take special orders! The set promotes hand-eye coordination, fine motor skills and imaginative play, and encourages beginning math skills.